Born February 2nd, Neil Russell grew up in the small town of Katy, TX. Neil’s first love growing up was sports. You could always find Neil carrying some type of ball around wherever he went. Football, baseball, basketball, you name it, Neil played it. Some of Neil’s friends and family members would joke that he was just like the US Postal Service, whether it was raining, snowing or sunny, through the heat of the summer or the cold of the winter, Neil would be outside playing a sport of some kind. During Neil’s early school years, Neil’s next door neighbor performed quite a bit in the greater Houston area. This is where Neil was introduced to the music industry. Neil would travel with his friend and watch him perform. Neil would take mental notes to things his friend did that made the on-looking crowd go nuts. Neil went mainly for moral support but was what you could call a “roadie”. As Neil hit his teenage years, Neil’s focus on sports grew. With it, his passion for music grew with it. Neil would use music as a motivational piece to his athletic prowess. Neil also participated in many extracurricular school activities. One organization he was apart of was the FFA. This is where Neil quickly learned how to make friends quickly. Neil was very outgoing and if he didn’t know anyone at an FFA event, he quickly made friends. Neil also began to show his interest in medicine. So during high school, Neil decided to combine his love for sports with his ever growing love for medicine and joined the Katy High Sports Medicine staff. This is where Neil’s “signature” signature was developed. Neil had been told that doctors had signatures that couldn’t be forged and Neil quickly developed his signature to be very reminiscent of a doctor’s. 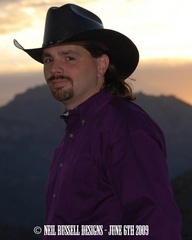 Shortly after graduating high school, Neil followed his family’s relocation to Arizona. While Neil continued to play sports, he held a steady job for a few years and then moved onto a new job that would challenge him even more. He went from working in a warehouse unloading freight trucks to a computer company working as a move coordinator then to bartending at a country club in a retirement community just south of Tucson. This is where Neil’s journey into music would begin, unbeknownst to him. The club manager at the time was looking for new entertainment options for the members. The manager brought in a karaoke company. The members of the club were not participating in the karaoke and Neil wanted to show them how easy it was. He sang one of the three songs he knew at the time and received rave reviews for his singing voice. Neil participated in a contest put on by the local radio station, KIIM 99.5 FM. The radio station was offering the winner the opportunity to sing on stage before some major Nashville recording artists at the radio station annual country music festival. The contest ran for two weeks with a winner from each weekend. Neil won the last weekend the contest was being run. The dream was quickly becoming a reality. The lineup for the festival was now complete. Here is how the lineup went; Cindy Standage, KIIM FM “Sing Your Way On Stage” winner 1, Luke Bryan, Neil Russell, Trent Tomlinson, Neal McCoy and Clay Walker. Before 8,000 screaming country music fans, Neil took the stage and delivered a masterful performance. Trent Tomlinson, who took the stage after Neil, commented to the whole crowd that Tucson had some talent. Neil is currently looking for a record deal to further his music career. Reached 38th in Best of Country chart in 2011. In the top 100 for 2 weeks.